The Ancient Egyptians knew the transcendental numbers pi and phi. They manifested their knowledge in their harmonic proportioning of their buildings and artwork. 1. The Golden Proportion (which numerically = 1.618), to which Western academia has recently assigned an arbitrary symbol—the Greek alphabet letter φ (phi)—was known and used long before the Greeks. And what is worse is that there is no factual evidence that the Greeks knew it at all! 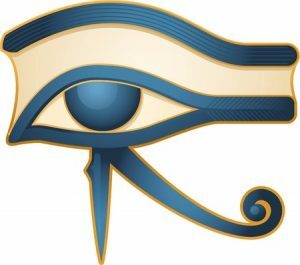 Integrity and honesty demand that an Ancient Egyptian term be used for this proportion; i.e. the Neb (Golden) Proportion. Neb means gold; divine. This proportion is also known in Western texts as Golden and Divine, since the 19th century. The Neb (Golden) Proportion can be derived mathematically from the Summation Series, which the Ancient Egyptians manifested its knowledge of at least 4,500 years ago. As the Summation Series progresses (2, 3, 5, 8, 13, 21, 34, 55, 89, 144,…), the ratio between successive numbers tends towards the Neb (Golden) Proportion. The ratios 55:34, 89:55, 144:89, etc. are all of the same “value” of 1.618. As shown earlier, Ancient Egyptian temples and shrines were segmented along the progressive numbers of the Summation Series—the significant points along the axis of the building plan. 2. The Circle Index is the functional representation of the circle. It is the ratio between the circumference of the circle to its diameter. It is popularized in Western academia by the Greek letter pi and given a value of 3.1415927. 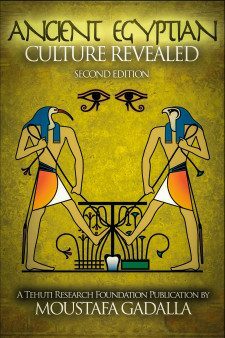 The Egyptians manifested their knowledge of the circle properties and other curves as early as their surviving records. A 3rd Dynasty [~2630 BCE] record shows the definition of the curve of a roof, in Saqqara, by a system of coordinates [shown herein]. This shows that their knowledge of the circle enabled them to calculate the coordinates along this vertical curve. Accordingly, construction workers followed precise dimensions in their executed circular curves. The Egyptians had also built their capitals with nine elements, and occasionally with seven, in addition to 6, 8, 11, and 13-sided polygons, because they knew the properties of the circle and its relationship to perpendicular coordinates and other geometric figures. Such application was evident in Egypt at least 2,000 years before Archimedes walked this earth. The typical Ancient Egyptian doorway layout incorporated both sacred ratios (pi and phi), as shown and explained herein. 2. The opening width is based on a square inscribed within a semicircle, the typical Ancient Egyptian way of proportioning a root-five rectangle. 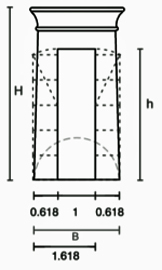 Thus, the thickness of the doorjamb is 0.618 the width of the opening.